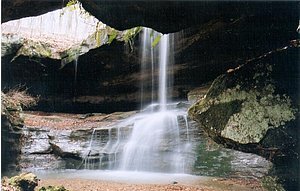 We are located in the beautiful Hocking Hills area of Southern Ohio. For nature lovers, there's 9 state parks, horseback riding, hiking, biking, camping, canoeing, and cabins. We are right off of St Rt33 in "Downtown" Sugar Grove, 5 minutes from the hugely popular Hocking Hills Market, where we have Plant-a-Rocks at Applachian Art & Craft. Towards Logan, our rocks are also at Serendipity and the Hocking Hills Craft Mall. Our business occupies 2 vintage commercial buildings. One was a general store, originally called Junkerman's. It serviced the canal boats that passed right next to it. When the canal was abandonded, Fox's Garage was built on top of the old #9 stone canal lock, which remains as a basement underneath it, still to this day. Next to us, there's a one room historical jail behind the village hall, and a little red caboose nearby. There's fresh pizza and sandwiches farther down Main Street at Stoneburners friendly grocery. If you are in the mood for a cold one, the popular stop off, the Handle Bar, is just catty-corner across the street, with live music on select evenings.